It helps us see how a graph – and hence, knowledge – is not merely a representational system, but is rather a perceptual system, where the graph is not merely the repository, but a growing and dynamic entity shaped by – and shaping – the environment around itself. The task for this week requires creating a graph. 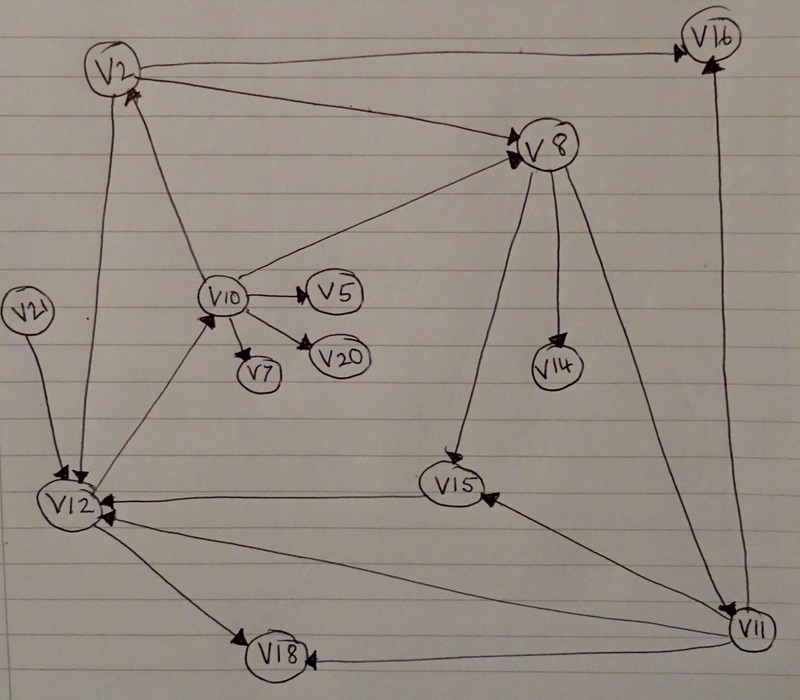 I am not very familiar with graph theory. I know some of the language – vertices and edges – and I have seen graphs, but have not known until now that they are called graphs, e.g. I am familiar with the work of Aras Bozkurt @arasbozkurt. See for example the dynamic graph he has created of Twitter activity on this course – https://twitter.com/arasbozkurt/status/1059543856394485760 That’s the limit of what I know about them, because, to be honest, graphs do not ‘light my fire’! However, I have completed the task, at a novice’s level, so no need to read on unless you too are a novice, in which case you might be interested. I now know a bit more, and made some interesting discoveries, the most important one being that the graph is only as reliable/trustworthy as the data that is put in. I will respond to each of the three parts of the task in turn. This is my graph – hand drawn, which takes longer, but was good for making me think. Before drawing this I first read the reading recommended in the newsletter – A Gentle Introduction to Graph Theory and watched a video that I found on YouTube – Graph Theory – An Introduction. As yet I have only skimmed the other references in the reading list, but have copied them at the end of this post for future reference. Below, I will describe the tortured way I went about this task. I was interested in blog posts, the number of posts each participant (who has submitted their blog feed) has made and the number of comments they have received. I went to my Feedly RSS reader where I have 20 blog posts in my EL30 category and went through all the blog posts relating to EL30, noting down the name of the blog, the name of the author, the number of posts made, and whether each post had received a comment or not, at the same time identifying who the comment was from. I then labelled each blog from V1 to V20. Having done this I was able to pull out all the blogs that have received comments, and identify in terms of V1 – V20, who these comments were from. I decided to only include comments from people in the EL30 course, whereas participants who already have an established network and blog, have received comments from people not participating in the course. I had to decide whether an invited speaker counts as a course participant for this activity. I decided No. I had to decide whether Stephen counts as a participant. I decided Yes. For simplicity’s sake I did not record the number of times someone commented on a single post. I counted them all as one comment. My main objective was to see who was commenting on which blogs. Later I skim read this article – https://medium.freecodecamp.org/i-dont-understand-graph-theory-1c96572a1401 and now think that some of these decisions were wrong, e.g. all participants should be in the graph even if they have not posted, or commented, on a blog. The participant might already be recognised as having expertise in the topic. But on second reading I realised that the question was about how individual nodes might vary over time. Presumably the significance of this is to show that the graph is dynamic rather than static. Of course, the graph I have drawn does not show this. It is static. I would have to draw a series of graphs over time to show it changing. This would then show that each node might vary over time by, for example, changing blogging practice, i.e. writing more or less posts thus increasing or decreasing the likelihood of receiving comments, commenting on other posts more or less (is this a function of the node or of the edge?? ), creating more than one blog, deleting a blog. At this point I realised that it is easier to think of each node as a blog rather than as a participant, so the blog might become more or less active, over time, more or less connected over time. Obviously all this becomes more obvious and easier with a graph that is automatically updated and changes in front of your eyes. An outstanding question I have is about the limits you put around a graph. For this graph I only looked at blogs and comments tagged #el30. But supposing there was suddenly no activity from any #el30 participant because they had all moved into new blogs and were now interacting with a different set of connections. How would we know that from this graph? I’m not at all sure that I’ve completed this task correctly. Given that this is a public post, it would be good if any errors were pointed out so that others can see them. This is a gentle introduction to graph theory. Graphs are data structures in which entities – called ‘nodes’ – are connected to other entities via some sort of a link – called an ‘edge’. In graph theory there are no limits on what can be connected, nor how they can be connected. Defining graphs in specific ways, however, creates the structures that underlie most of the modern web. Graphs are important types of data structures. Instead of thinking of things in rows and columns (the way we would in a spreadsheet or a database) we think of things as nodes and edges. This page has a very brief description of a graph data structure and then a long list of things that can be done with graphs – cycling, sorting, spanning, searching. This page is meant to explore, not to learn – follow the links, try running some of the code (click on the r’run in IDE button’). I liked how you explained your process, which shows that the really difficult part is not the colorful mass of ‘edges’ but the difficult decisions of how to MODEL the reality into these primitive structures. And it also shows that there cannot be a ‘correct’ methodology to do that. Really thorough and clear description of how you approached and carried out this task Jenny thank you. I think it’s anything but novice. I had also been thinking of drafting a similar graph plotting #EL30 participants blog posts and the number of comments they had received. Unfortunately, by my commenting here I’ve unintentionally skewed your graph! I see from your post that you had already been considering the merits of dynamic vs static graphs. Many thanks Matthias for your reassuring comment. I found this quite a daunting task. But it is all quite stimulating and it feels good to be engaging with new ideas (or at least new to me).